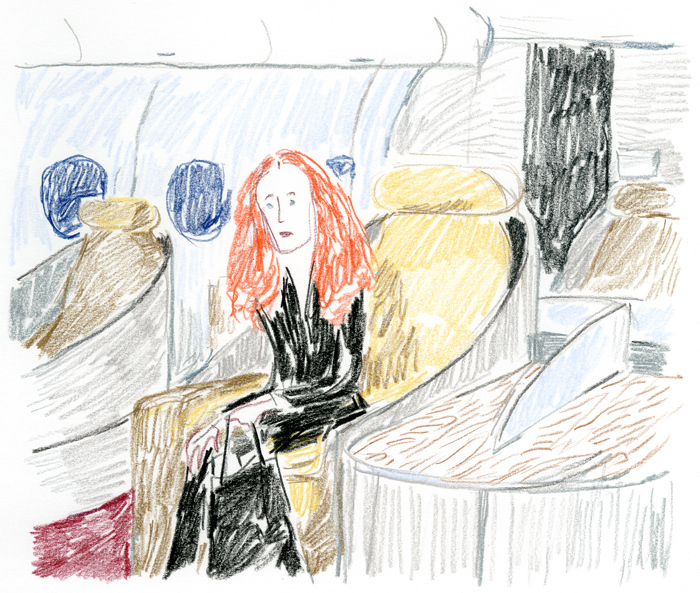 It was night at JFK, and the boarding of the giant A380 seemed to never end, when recognizing the silhouette of Grace Coddington seating front row reminded me that Paris Fashion Week was about to start. For all who saw the The September Issue, and fell under her charm, Grace seems to possess the disillusionment of a true philosopher, while being more of an artist than most photographers, more of an artist in fact than most artists who’d rather have their new summer house featured in Vogue than their last show reviewed in Art Forum (although, of course, both are necessary). I was lost in my reflections on Grace, assuming that under these conditions, a First class solitude must be complimentary, when I was suddenly brought back to shared reality by a “Can I see your invitation ? ”. I was then urged with the herd to the standing row, by a flight attendant who had the fierce insensitivity of a PR assistant.